Left stick (1) and right stick (10): These are small joysticks, raised above the controller surface, with concaved rubbery pads. 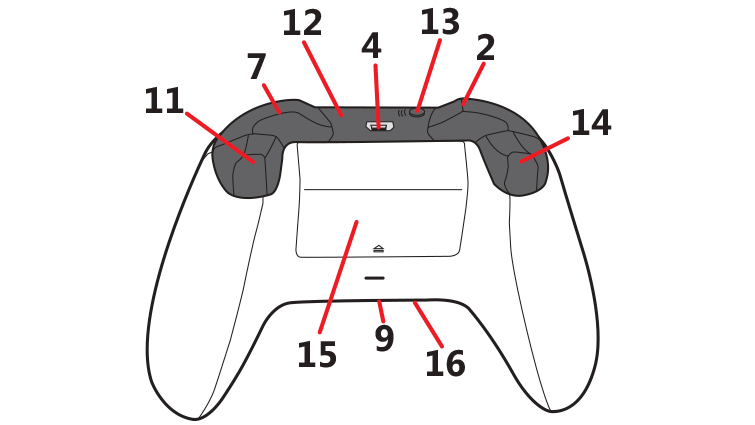 The left stick resides on the lower left of the front face of the controller, and the right stick resides on the lower right of the front face. The sticks are used to interact with games, apps, and the Xbox One interface. These move directionally, and they can also function as clickable buttons when you press down on them. Left bumper (2) and right bumper (7): These are oblong-shaped pressable controls that reside on the top of the controller to the left and right of the USB charging port. 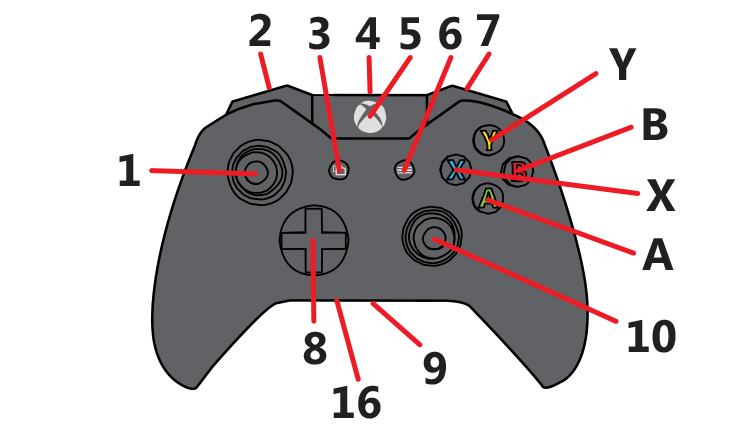 These controls are used to interact with games, apps, and the Xbox One interface. They are often used as accelerators to jump between sections of the UI but have varied functionality depending on the game. View button (3): This button resides just to the lower left of the Xbox button (around 7 o'clock). Use this button to focus in on an activity in a game or app, such as pulling up a map during a role-playing game or accessing the address bar in Internet Explorer. The functions of this button vary depending on the app or game. USB charge port (4): This port resides on the top edge of the controller above the Xbox button. It's a recessed mini USB port, which connects your wireless controller to the console using a mini USB cable. For more information, see About the Xbox One Play & Charge Kit. When the controller or console is turned off, hold this button to turn on the console. If the console is already on and the controller is off, hold this button to turn on the controller. When the controller and console are already on, hold this button to turn off the console. When the controller and console are already on, press and hold this button until it rumbles and from there you can turn on Narrator or magnifier. See Turn on Narrator on Xbox One for more info. When using the console, press this button once to open the guide. When using the controller with a Windows 10 device, this button opens the Game bar when pressed during PC gameplay. Exception: During game streaming through the Xbox App for Windows 10, pressing this button returns you to the Home screen of the Xbox App for Windows 10. Menu button (6): This button resides just to the lower right of the Xbox button (around 5 o'clock). Use this button to access game and app menu options like Settings or Help, along with commands within the user interface such as Enter on a keyboard. Directional pad (D-pad) (8): This is a raised plus sign-shaped toggle that resides between the left and right thumb sticks. It moves the focus up, down, right, and left in the UI. Used to interact with games, apps, and the Xbox One interface. Expansion port (9): This is a recessed port that resides on the bottom-side edge of the controller. It's used to connect other accessories, such as an Xbox One Chat Headset. 3.5-mm port (16): This is a recessed port next to the expansion port on the bottom-side edge of the controller. Used to connect compatible 3.5-mm audio devices. Only available on controllers released after June 2015. 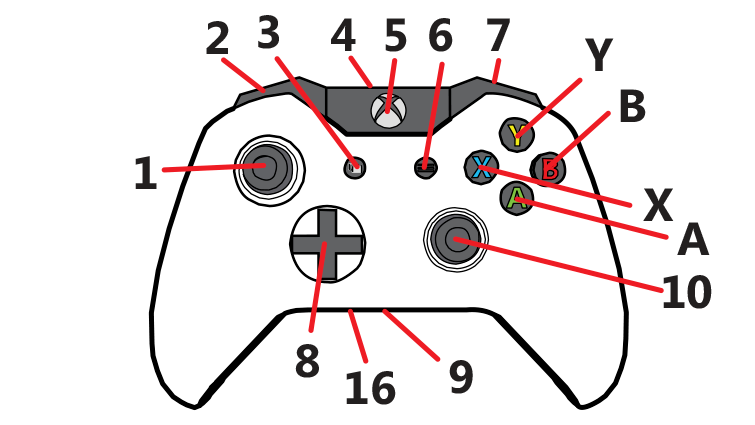 A , B , X , Y buttons: These buttons sit on the right side of the controller. The Y button sits in 12 o'clock position, with B, A, and X positioned clockwise. Used to interact with games, apps, and the Xbox One interface. Infrared (IR) window (12): Hidden behind the “smoked” plastic next to the USB port are infrared LEDs used for auto-pairing users to the controller via the Kinect sensor. To learn more about this feature, see How to assign an account to an Xbox One Wireless Controller. Wireless enrollment button (13): This small, slightly raised button resides just to the left of the USB port on the top edge of the controller. Used to wirelessly connect the controller to a console and to enroll in Bluetooth pairing on a Windows 10 PC. For more information, see Connect a wireless Xbox One controller to your console. Right trigger (11) and left trigger (14): Positioned just below the bumpers on the front-top edge of the controller. 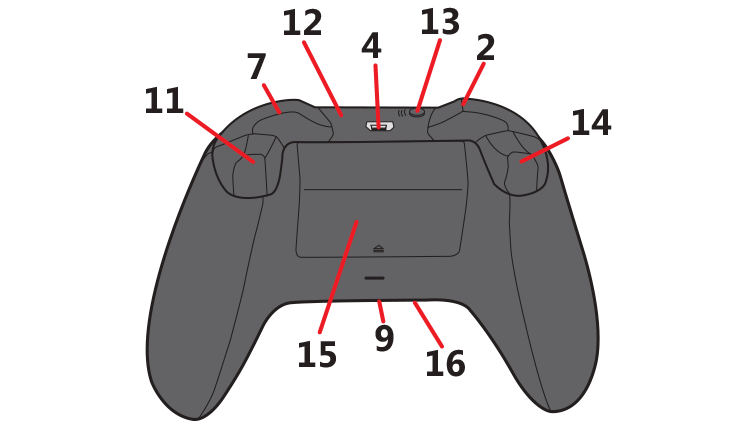 These are pressable controls most commonly used during gameplay. They often vibrate to provide feedback during the games, though you can turn off vibration in the controller settings. Battery compartment cover (15): Sits on the middle back of the controller. Would you like to contact Support regarding the "Get to know your Xbox One Wireless Controller" issue you were reading about or a different issue?